This story is from ST Monday April 18, and I am only writing about it because my mind keep going back to it. I suppose I am in some way angry about this but I am too busy and especially powerless to do anything meaningful about it. Why else would I keep remembering? The reason why so many people die at the work place is very simple. Safety is not priority one. The very same obverse reason why far fewer people die in air crashes because safety is priority one. So what effort? Where your heart is, there would be outcome you can expect. Delivering projects on time, maximizing profits ahead of safety then you can expect more injuries and deaths. The faster you make them work the more accidents you will experience. So sounding trite but it make sense, if you stop work nobody gets hurt as well. So how do some bosses and the government try to deliver a safe environment? Silly wishes and praying of course on top of nagging at the workers. 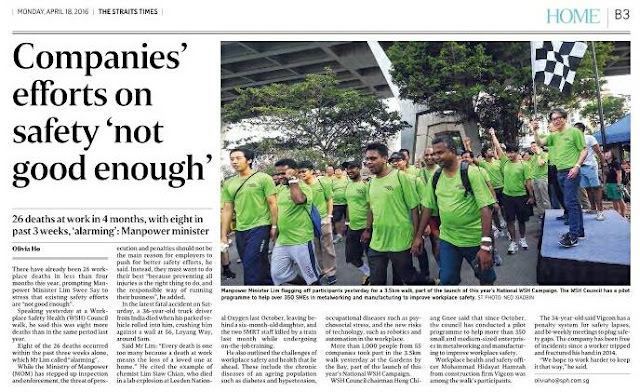 Meanwhile Mindef gets singled out for extra public whipping but ironically they are one of the safest place. Just unlucky. Standards are falling in Singapore. People are careless about protecting personal data and now they get fined but I doubt they will learn. They were careless about infection control in SGH and so Hep C killed more than a few but SGH was just unlucky as it could have happened in any of our hospitals. So how could you name and shame them publicly? Everyone has been careless and negligent but some are more unlucky. We are losing our values.